If you will, take a close look at these to photographs. They are, in fact, identical in all ways except photographically. There's wherein lies my dilemma. I have this one photograph of a delicious cupcake, created in two different manners. I want to add one of them to the [food] section of my website, michaelanthonymurphy.com. I can't decide! I need your help. Enjoying work in the culinary world, photographing food, has, as of the last year or so, become quite a powerhouse addition to my portfolio. More than just a force, I have grown to really love the challenges and differences that comes with shooting food as compared to shooting humans. Recently, after reviewing my website, I have come to realize that most of what, scratch that, all of what I have posted in the food gallery are savory dishes. There are zero desserts, none of the sweet stuff. I decided I had to grow this meal course and begin to add some culinary sweetness to the portfolio. I decided on a big ole' cupcake courtesy of Rittenhouse Market, located at the corner of 18th and Spruce, in Rittenhouse Square, Philadelphia. Rittenhouse Market, for the past decade, has been my goto supermarket. They cater to locals like myself who appreciate quality ingredients. You won't find generic brands there. 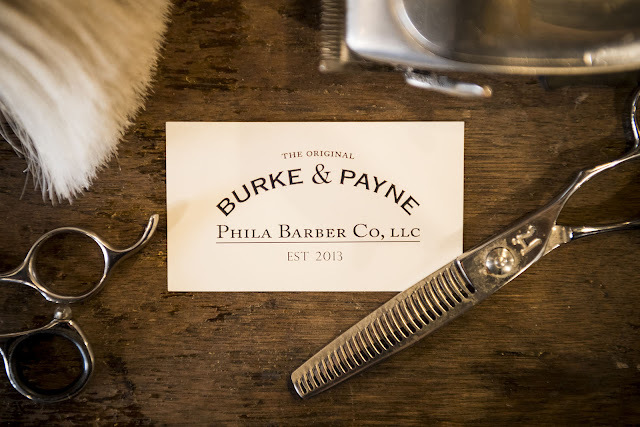 Replacing the generics are the higher quality, boutique, specialty brands, the good stuff. The cupcake of choice? One, ginormous, carrot cake cupcake. These ain't your mama's Betty Crocker cupcakes. These are fresh from a local bakery (I forget which) and as big as, hmmm, I don't know, an infant's head, a grapefruit or a melon. This sucker is a probably six inches tall and six inches in diameter. I carried this beautiful cupcake home with the utmost delicacy, as if it were a nuclear bomb with a hair trigger (oh, hello NSA). Now that's some powerful SEO! Maybe not the right audience but eyeballs nonetheless. I digress. Upon arriving at home, I then carefully placed the nuke, er, I mean cupcake on the kitchen counter, staring intently, trying to decide how I wanted to shoot the behemoth. I had decided I wanted to work at a really darker level. The black cafe table and brick wall, would be a great set location for the delicious dessert. Once I took some test shots, I was feeling that the scene was still a bit bland. Coming from a guy who has a hard time making toast, I surprised myself that I came up with the idea to add a dusting of flour to the set. The whiteness of the flour would bring up the dark scene just enough to add some interest and texture to the entire image. I was working in a controlled environment, I had the heavy curtains drawn over the windows to keep from any sunlight from contaminating the scene. You may think a bright day with the sun shining, high in the sky, wouldn't hurt an exposure? Think again. I promise, little, itty bitty clouds can creep across the sun and screw up your carefully calculated shot without your even knowing it. Better to be safe than sorry. With the curtains drawn, I had a couple of tungsten lights in the room, barely illuminated, dimmed way down. These lights would have zero effect on the image but I used them to make for locking in focus an easier task. Sure, the Nikon D4 can lock focus in the pitch dark but I promise it isn't as easy as you may think. Rather than test Betsy's (My D4), I thought having a bit of light would be a better choice. 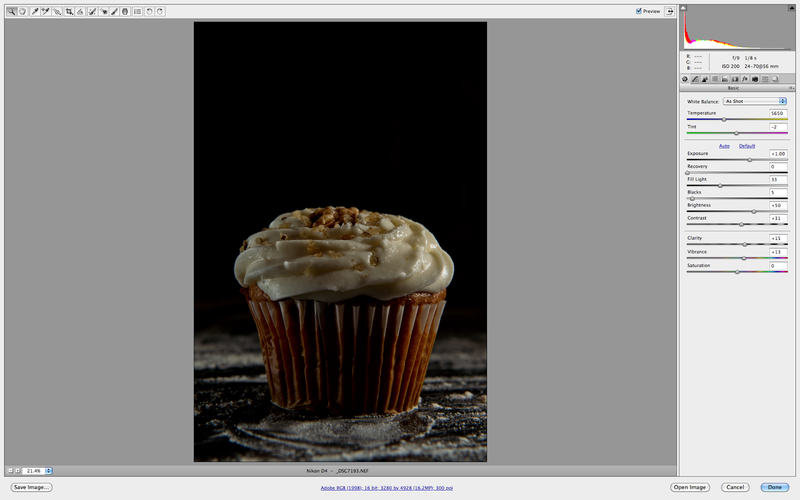 I began choosing the aperture, going with f/9.0 would give me a greater DOF, getting lots of the carrot cake in focus. Next, I worked shutter and ISO, tweaking each until I could find a happy medium. I was not concerned about the slow shutter speeds as I was working with a solid set of [sticks]. FYI, my carbon fiber tripod system from Feisol is effing awesome. Feisol is a high end, specialty tripod manufacturer that, well, they have simply knocked my socks off with their amazing products, as well as their customer service. They have gained a life long customer after my first investments with the company. Where was I? Oh yeah, exposure. Anyway, I could have taken the shutter as slow as my heart desired with the Feisol in place. Now, on the other hand, I didn't want to play too extreme with these settings as when I bring in the strobes, I like to have some wiggle room to tweak in either direction. Had I been down at ISO 50 or something like that, I would corner myself, limiting my tweak abilities. I preferred to play in the middle ground. I decided to work with two speedlights, one camera right and one camera left. I would need to modify them in some way. Not wanting to go super big, I decided to pull out two 45 inch Calumet convertible umbrellas. The 45s, in my humble opinion, are big and soft but not overly big. For cupcakes, yeah, they may be large but we aren't finished yet. I wanted to shoot into the brollies to have more control over spillage. Shooting through causes a whole hell of a lot of spill and contamination. I needed pure control. To further this control, and using a trick I learned from Zack Arias, I closed the umbrellas a bit, narrowing and controlling the beam even more, giving them a recessed softbox-esque quality of light. The strobes of choice were one Vivitar 285HV and one Canon 430EX ii. My triggering system was by way of a few Pocketwizard Plus ii transceivers. Sure, they are a couple years old now but I will say, I would highly recommend these to anyone in the market for high quality pro triggers. I would definitely recommend my older triggers over much of the new junk out there that Hong Kong has been shoving down our throats, for insanely low prices. Hey, you get what you pay for. Pocketwizard is the industry standard. Period. If you read this blog from time to time, you will realize that, with my arsenal of gear, I prefer to use the Nikkor 24-70mm f/2.8G ED. Why? For the simple fact that I can get in and focus a little bit closer than some of my other lenses. I don't own macro glass so for close focus, the 24-70 does the trick just fine. Believe it or not, these are screenshots of the actual, unedited RAW files. Downloaded and opened in the Adobe Camera RAW editor. I haven't made a single move with the files at this point. Notice anything? Probably best to click the image and look a bit closer. Ok, the top screenshot is of the finished cupcake on the left (DSC_7192) and the bottom screenshot is of the finished cupcake on the right (DSC_7193). Exposure was exactly the same but lighting, lighting was ever so slightly different. The top one (DSC_7192) shows a much darker image (remember, I was going for dark). For this, the strobes were at super low power. Camera left was 1/16 and camera right was 1/16, distances slightly differed. As for the second screenshot (DSC_7193) , things were a bit different but not by much. For the second, bottom, screenshot (DSC_7193) , I applied the Inverse Square Law. I was able to achieve this brighter cupcake simply by moving the strobes a bit closer and reducing the flash to subject distance, therefore, getting more light from the flash heads without using any more power. Cool right? Who would have thought physics could be fun? Obviously, out of camera, without editing, one would immediately prefer the better lit, although still maintaining the desired darkness, second file (DSC_7193) . I would agree, that is until I decided to work both RAW files, going for different results. Most people would see the top screenshot as garbage (DSC_7192) . A file made for the recycle bin. I, on the other hand, have faith in all files which is why I rarely, if ever, delete anything. 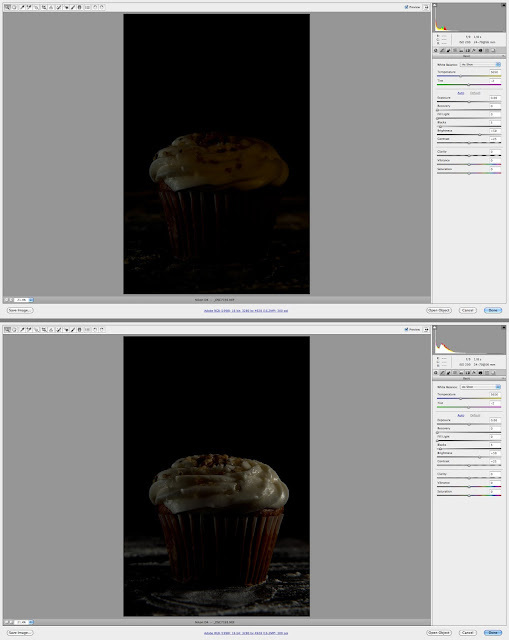 Here is the editing that went into cupcake left (DSC_7192). Take a look at the adjustments. First of all, I took the white balance way down to a cool 3500 degrees on the Kelvin scale. Next was pure light adjustment, taking the exposure up 1.5 stops, along with some other tweaks to get some better brightness and balance. 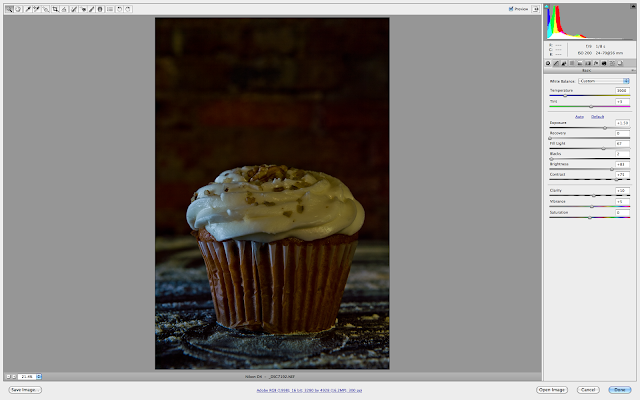 Remember, this cupcake was totally in the dark but I was able to bring up the file and along with it, bring in the brick wall background, even if ever so slightly. I immediately fell in love with this file. Now let's take a look at the other cupcake (DSC_7193). This one played out much different when processed, for my taste anyway. I left the white balance as was set in camera which was either flash or daylight balanced. For the exposure, besides bumping up one full stop, there was much else to do. 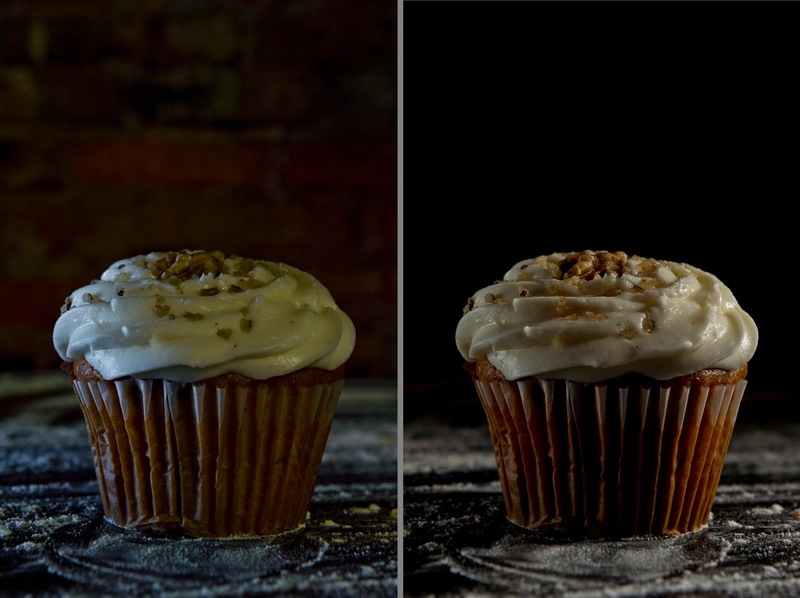 If you go back up and take a good look at both photographs, you can see clearly that although they are the same delicious carrot cake cupcake, they are quite different from each other, photographically speaking. So, Which Is The Winner? Guys, gals, I'm having a super hard time deciding which of the two I like the best. Does this happen often? Eh, not as much as it used to. I think over the years, working with photographs, I have come to move through them at a much faster rate, knowing instantly which stays and which goes. For some reason, unbeknownst to me, these friggin' cupcakes have become a thorn in my side. My favorite? My point of writing this was first to have you, the readers, help decide which carrot cake cupcake would make it to the website and also to show how the poorly exposed file could be saved and turned into pure awesomeness. By now, I'm a bit more confused as I once was leaning towards one photo. Now? Not so sure. DSC_7192? Why would I choose this photograph? I like how the brick wall background comes into play. Why wouldn't I choose? Lacks the pop and contrast that DSC_7193 maintains. DSC_7193? Why would I choose this photograph? I like the pop and contrast that DSC_7192 seems to lack. Why wouldn't I choose? I prefer seeing the brick show, even if ever so slightly. Friends, I need your help. Which is your favorite? If you want, be sure to tell me why you like one or hate another, I promise, I have thicks skin, you won't hurt my feelings. Be sure to look for the posting on one of those sites that links back to this page and comment there.